Our Timeshare Resale Agent of the month is Sharon Reper of Fidelity Real Estate Agency – Timeshare Division based in Orlando, Florida. 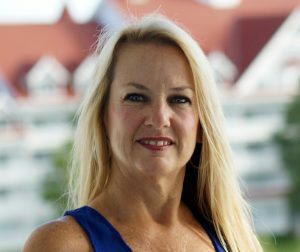 Sharon is a native of Florida, has been a Real Estate Agent selling Disney Vacation Club for 4 years, with a total of 16 years in the resale industry. Before this she was the customer service manager for 9 years with Timeshares Only and was given an opportunity to transfer to its broker division and become a Fidelity Real Estate agent who could specialize in Disney Vacation Club. “What a great opportunity it was and a perfect fit for me. I realized buyers and sellers have the same value of family and love to vacation as I do. I have chosen to be a specialist with The Disney Vacation Club brand because I feel my attention to detail allows me to cater to the specific needs of this marque client base. I have the ability to explain the product and provide them the trust and surety they require throughout the entire purchase process”, Sharon says. And we have closed our share of Disney transactions for Sharon, developing rapport with the same Disney personnel she has an established relationship with, in order to obtain speedy response and service when needed throughout the transactions. Sharon has been recognized with top lenders in the industry with top referrals for high volume of business, and on social media and blogs as the go-to expert within the community for Disney transactions. She has excelled in customer service with many highly regarded testimonials from satisfied clients, and is highly respected by peers within the broker community, which comes naturally, having been a customer service manager for most of her career previous to being an agent selling Disney Vacation Club. Sharon has enjoyed timeshare travel with her family to many different islands, and most recently has been bitten by the “cruise bug”. She is happily married with two children. “I love the islands, boating and traveling, most of all, I love spending time with family and working out.